To all our Prestone supporters in Australia we are currently having a supply problem from the USA and stocks are running out fast! Please do not hesitate to contact us for any suitable substitutes we may have to fulfill your needs. Since 1927 when the Prestone® brand first introduced Antifreeze/Coolant for automobiles, people have trusted the Prestone® name for outstanding protection in their car's cooling systems. Today's cars and light-duty trucks are more complicated than ever. Antifreeze/Coolants come in a variety of colours and chemistries. So which one is right for your vehicle? Prestone® Concentrate Antifreeze/Coolant is the ideal solution to help your engine last longer. Fortified with the new patented Cor-Guard™ improved extended life technology, Prestone prevents corrosion and helps keep your cooling system running more efficiently. Keep your entire cooling system, including your radiator and water pump, free from the damaging effects of worn-out antifreeze. Use Prestone, the antifreeze specifically designed for the sophisticated engines in today's cars and light-duty trucks. Your vehicle depends on antifreeze/coolant to run. The proper concentration of antifreeze/coolant allows your car to run optimally. Help prevent your cooling system from freeze-up or boiling-over by replacing your worn out antifreeze with new Prestone with Cor-Guard™ inhibitors. This patented formulation helps keep your engine running at an optimal temperature, reducing the risk of breakdowns and helping your engine run efficiently. Additionally, Prestone's patented corrosion inhibitor package protects your cooling system from corrosion and cavitation. Prestone® Extended Life Antifreeze/Coolant is compatible with ANY antifreeze/coolant – regardless of colour – for use in ALL makes or models of cars and light duty trucks. This patented formula provides a high degree of performance durability and carefully balanced protection against temperature extremes and rust and corrosion of all cooling system metals, including aluminium. The Prestone® team takes the guesswork out of knowing which antifreeze to choose from with our newly re-formulated Antifreeze/Coolant that is compatible with ANY Antifreeze/Coolant found in ANY make or model car or light-duty truck on the road today. WARNING: HARMFUL OR FATAL IF SWALLOWED. KEEP OUT OF REACH OF CHILDREN. CAUTION: Do not remove radiator cap when engine is hot. See owner’s manual for any special cooling system service instructions. Do not store antifreeze/coolant in open or unlabeled containers. Wash exposed skin thoroughly with soap and water after use. Disposal of used antifreeze/coolant: Follow local laws and regulations. If required, dispose at facilities licensed to accept household hazardous waste. If permitted, dispose in sanitary sewer systems. Do not discard into storm sewers, septic systems or onto the ground. Prestone® Concentrate Extended Life Anti-freeze/Coolant also available! Since 1927 when Prestone® brand first introduced Antifreeze/Coolant for automobiles, people have trusted the Prestone® name for outstanding protection in their car's cooling systems. Prestone® 50/50 Prediluted Antifreeze/Coolant is the convenient way to top off your car's cooling system with the superior protection of Prestone antifreeze. Prestone's new Cor-GuardTM enhanced, improved extended life antifreeze, helps rejuvenate your car or light-duty truck's tired, existing antifreeze. This ready-to-use solution provides your car with the enhanced Cor-GuardTM inhibitor package and patented Prestone formulation that prevents corrosion and helps your engine run longer. Use Prestone to keep today's sophisticated cooling system running efficiently. Prestone® Radiator Flush + Cleaner is a 2 in 1 formula designed for light flushing and heavy duty cleaning for cooling systems to help prevent overheating, the #1 cause of engine failure. 1. With engine off and cool, remove radiator cap. * Drain radiator then close draincock. 2. Pour entire contents of Prestone® Super Radiator Flush into radiator and fill with water. For systems larger that 12 quarts, use two bottles. 3. Run engine with heater on highest temperature setting for 10 minutes after reaching normal operating temperature. 4. With engine off and cool, remove radiator cap, drain radiator, and close draincock. Refill with water and replace radiator cap to fully closed position. Repeat step #3..
5. Stop engine and allow to cool. Remove radiator cap, drain system and close draincock. Add enough recommended coolant to achieve a 50-70% concentration. Top off radiator with water. Replace radiator cap to fully closed position. Run engine for 20 minutes to mix coolant/water. 6. If equipped with a non-pressurized coolant reservoir, rinse, drain, and refill with a 50-70% solution of the coolant and water. CAUTION: MAY IRRITATE EYES. Do not get in eyes. KEEP OUT OF REACH OF CHILDREN. FIRST AID TREATMENT: Contains Sodium Citrate. If in eyes, rinse with water for 15 minutes. If on skin, rinse well with water. If swallowed, call a Poison Control Centre or doctor immediately. Do NOT induce vomiting. This premium formulation is designed to remove heavy rust and scale deposits in neglected cooling systems. These deposits can dramatically restrict coolant flow and reduce heat transfer, which may lead to possible overheating, breakdown, or costly repair. A super chelating additive effectively removes heavy deposits by drawing metal oxides into solution. Though strong enough to help restore maximum cooling system efficiency, this non-toxic, non-acidic product is easy to use and safe for all cooling system metals. Non- acidic Prestone Super Radiator Cleaner is easy to use. This formula removes heavy rust and scale deposits. With engine off and cool, remove radiator cap. * Drain radiator then close draincock. 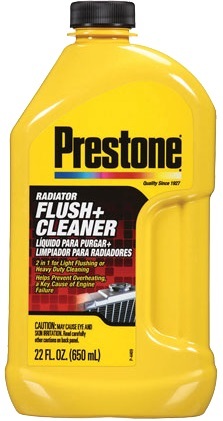 Pour entire contents of Prestone® Super Radiator Cleaner into radiator and fill with water. For systems larger that 12 quarts use two bottles. Replace radiator cap to fully closed position. Drive a total of 3 to 6 hours (normal driving) - may be intermittent and over a period of several days. With engine off and cool, remove radiator cap, drain system, and close draincock. Refill with water and replace radiator cap to fully closed position. Run engine with heater on highest temperature setting, for 10 minutes after reaching normal operating temperature. Stop engine and allow to cool. Remove radiator cap, drain system and close draincock. Add enough recommended coolant to achieve a 50-70% concentration. Top off radiator with water. Replace radiator cap to fully closed position. Run engine for 20 minutes to mix coolant/water. If equiped with a non-pressurized coolant reservoir, rinse, drain, and refill with a 50-70% solution of coolant and water. NEVER SYPHON BY MOUTH. * The cap on newer vehicles may be located on a remote, pressurized overflow reservoir. Follow instructions given for radiators, but add product and coolant to reservoir. Much longer running time may be needed to introduce product into system. 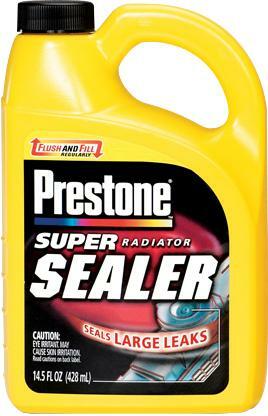 Prestone® Super Radiator Sealer’s special formula helps seal larger size leaks. Shake well to ensure uniform distribution of active ingredients. With engine off and cool, add entire contents to overflow tank or radiator. Replace radiator cap and run engine to mix thoroughly. Super Radiator Sealer takes sealing performance to a higher level. Its unique combination of natural and synthetic components provides the ability to seal leaks up to 0.016” X 0.5”. What makes this possible is the size, strength, and durability afforded by fibrillated Kevlar® particles, the same materials in bullet proof vests. Super Sealer’s particles have been chosen to seal even large leaks without interfering with the flow through the radiator and heater core tubes. Super Radiator Stop Leak works quickly when poured directly into your radiator. One bottle stops leaks in all major parts of your cooling system, including your radiator, heater core gaskets, and hose connections. Protects against corrosion and pitting in your cooling system, the common reason for leaks. With engine off and cool, remove radiator cap. Shake bottle. Pour contents into radiator. For systems larger than 12 quarts capacity (check owner's manual), use a second bottle. Be sure radiator is full. Consult owners manual for coolant type and add 50-70% concentration of the recommended coolant, if needed. Replace radiator cap. Run engine at idle, with heater "on" for 10 minutes after reaching operating conditions. Check for leakage. If leak has not stopped after treatment, mechanical repair may be necessary. With engine off and cool remove radiator cap and check fluid level. Be sure radiator is full. Add recommended coolant, if needed, to radiator and coolant reservoir. Replace radiator cap. A super-concentrated formula designed to clean injectors, combustion chambers, intake valves and carburetors in one tank. Helps restore performance and acceleration lost due to fouled injectors and deposits in the system. For tanks up to 20 gallons. Add entire contents to tank of gasoline. Use every 4,000 miles to clean fuel injectors, intake valves, combustion chamber deposits, and carburettors. Using the highest level of state-of-the-art detergent technology, Prestone Complete Fuel System Cleaner is formulated to provide complete system cleanup from fuel injector and intake valve deposits to combustion chamber deposits. From one end to the other, this one-tank cleanup of fuel injectors, intake valves and combustion chamber deposits ensures proper spray atomization of fuel into the combustion chamber. This helps maximize combustion efficiency and to remove deposits that can compromise performance, power and fuel economy. One Bottle of Prestone® Diesel Fuel Treatment will treat up to 35 gallons, which is the average tank size of full- size trucks on the road today. This easy to use, one bottle application, will help protect diesel engine fuel systems from deposit build-up and corrosion, and will also clean fuel injectors to help improve engine performance. Detergents solubilize deposits on fuel injectors and help disperse deposits from diesel fuel systems. Also, helps keep fuel system clean by preventing deposits from forming. Prestone® Belt Dressing conditions V- belts and fan belts to prolong belt life. Promotes better grip and traction, eliminates squeaks and chattering. Helps prevent premature wear. The formulation prolongs belt life by conditioning the belt to help restore the original surface chemistry and friction to better grip the pulleys. One treatment stops most leaks and keeps fluid in the system…not on the ground. Also contains conditioner to revitalize seals. Excellent preventative maintenance product. Good for high and low mileage vehicles. With engine off, fill power steering reservoir to specified level. Follow directions given in owner’s manual for adding fluid. Do not overfill. May be used instead of regular power steering fluid. After using product, always wash exposed skin thoroughly with soap and water. Designed for today’s vehicles with disc or drum brakes. Exceeds DOT-3 specifications and provides an extra margin of safety in extreme braking conditions. Suitable for disc, drum, or ABS brakes. Meets or exceeds DOT-3 and DOT-4 specifications and provides excellent performance in high-temperature braking systems. Provides corrosion protection for all metals within the braking system. Professionally backflushes cooling systems of most cars and light trucks on the road today. Easily installs antifreeze/coolant in minutes. Make sure engine is cool, then loosen radiator cap to release any pressure and re-tighten cap. If radiator has no cap, loosen and re-tighten the pressure cap on the expansion tank, if so equipped. If it has a conventional recovery system (a non-pressurized plastic bottle) and no radiator cap accessibility, vent and reseal the system via the cap covering the thermostat. Two heater hoses extend from the fire wall to the engine, in both front and rear wheel drive vehicles. Hose #1 runs from fire wall to water pump. Hose #2 runs from fire wall to top of engine. This is the heater inlet hose. Ask a qualified mechanic if uncertain. Make sure engine is cool, remove radiator cap and Flushing TEE Cap. Attach Back-Flow Preventer Coupler to Flushing TEE and water supply line (black end to tee, Yellow end to garden hose). If vehicle has no cap on the radiator, it is possible to back flush by disconnecting the upper radiator hose at the radiator. When appropriate, snap Splash Tube into radiator neck and open radiator drain. Turn on water to garden hose. Check to see that liquid is emerging from the Deflector Tube or radiator hose fitting before proceeding. Determine how much Prestone® Antifreeze/Coolant to install to achieve a minimum 50%, maximum 70% solution for year round protection. With cap off TEE, pour the full amount of Antifreeze/Coolant into radiator, expansion tank, or thermostat housing opening. Water and slight amount of diluted Antifreeze/Coolant will be displaced from flushing TEE. After adding antifreeze/coolant, quickly replace Flushing TEE Cap. Make sure gasket is in place. Tighten securely by hand. Replace radiator cap. Run engine for 10 minutes after reaching normal operating temperatures, then shut engine off and allow to cool. Add more Antifreeze/Coolant to properly fill the system. Replace cap tightly. 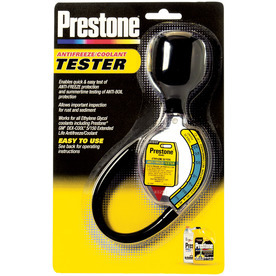 A professional do-it-yourself tester that easily tests for anti-freeze/anti-boil protection. Allows visual inspection for rust and sediment. Test when engine is cool. Draw up fluid, inspect. If rusty or dirty, drain, flush and refill cooling system. Pointer must be totally immersed. Fluid should be level with horizontal line at top of tester. Tap to dislodge air bubbles. Pointer shows degree of protection. To clean tester flush with hot water. It is important to maintain your antifreeze/coolant at the proper concentration to provide good corrosion protection as well as prevent freeze-ups and boil overs. This tester provides a quick and easy method to safely collect a sample and measure coolant concentration. It also allows a visual inspection of the antifreeze while you test it. This is a low cost way to check the condition of the antifreeze/coolant in your vehicle when you need to. USE THE LEFT HAND MENU WHEN ENTERING SHOP! CLICK ME TO ORDER PRESTONE PRODUCTS ON-LINE! See Noel Comerford's Auto Parts for all your Quality Prestone Products.